One I haven’t come across one of these before: A Southern Angle-headed dragon. Apparently they live in the rainforests around us but this is the first on I have seen. He was pretty placid until I tried to pick him up! Then he posed for me in this shot – have a look at the shutter speed 4seconds and not a flicker of movement! He has a lovely long tail which you can see stretching away behind him. This huys was seen on the southern slopes of Mt Mitchell, just below the saddle just on dusk. I’ve not seen one in all my years walking Lamington until my last Stinson trip (last September). Maybe they’re becoming more populous….. Pretty cool lizards though. Like little dragons. Hi Martin, great to hear from you. I’ve never seen one either and was very excited to see this one. 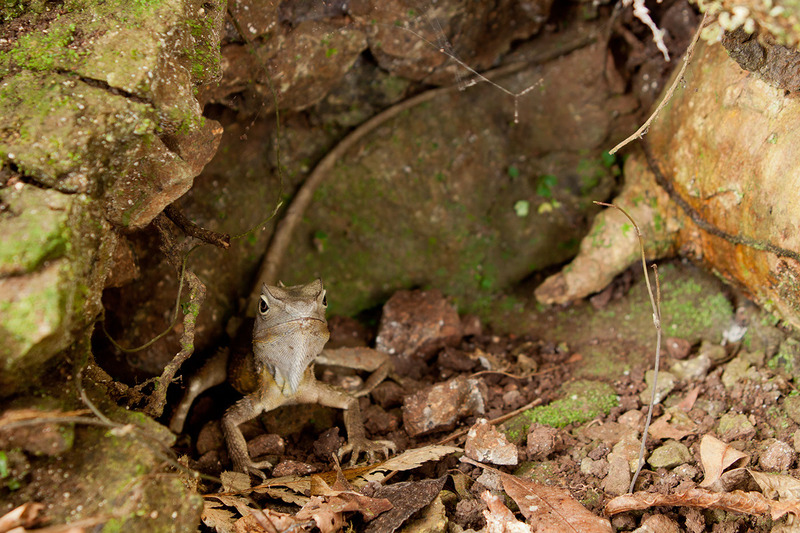 He was hiding in a little hollow under the tree roots just off the path in the upper rainforest section of the Mt Mitchell walk. I’m hoping to get back up to the Lost World plateau this year – the last time I was there was the walk I did with you years ago!